Innovation inspired anything! Innovation is always crunchy. Defining innovation. This is really a good read! Innovation is creating the new. Innovation is forward thinking combined with action. Innovation is the key to change. Innovation is the new “normal”. If innovation is all of this and more why do we still continue to shy away from it? Because of the unknown factors? Because of how many mistakes we make to get to the actual innovation. Because others don’t believe like we do. Because anything that makes people work beyond minimum effort is shunned. Because the responsibility “seems” too great. Because we were never taught to embrace change. 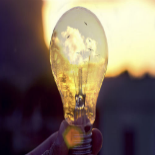 This entry was posted on August 8, 2013 by Elvan de Santos in Top Tips in Innovating and tagged Business and Economy, Creativity, Innovation, Innovation and Idea Management, Invention, Knowledge Creation, Knowledge Management, Thomas Edison.